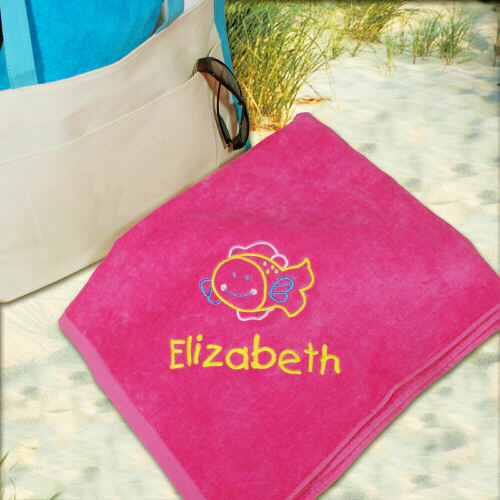 Your little girl will enjoy the pool, beach or boat even more this summer with her own Embroidered Beach Towel featuring a fun and cute fishy and her name. A great personalized towel for the summer made especially for your daughter, granddaughter or niece. Your Personalized Beach Towel measures 30" x 60" and is made of 100% cotton loop terry fabric. Includes FREE Embroidery. Personalize your Beach Towel with any name. I bought this as a gift. I have taken it out of the package and am impressed with the looks and quality of the towel. The color is very vibrant. I hope it washes up and continues to look just as good. Love all of the towels. Good Quality. Great for the pool, beach and bath. Given to my granddaughter. I should have ordered one for myself. Additional Details GiftsForYouNow.com offers many Personalized Outdoor Decor Gifts for enjoying the sun, patio or shade. Shop GiftsForYouNow.com for all your Unique Housewarming Gifts at low, low prices today.